A paper published today in Climate of the Past reconstructs solar activity over the Holocene [past 10,000 years] and finds solar activity during the 20th century was at relatively high levels in comparison to the rest of the Holocene, but that "Solar activity is during 28% of the time higher than the modern average (650 MeV), but the absolute values remain weakly constrained due to uncertainties in the normalisation of the solar modulation to instrumental data." The authors predict solar activity will decrease in the 21st century, stating, "Autoregressive modelling suggests a declining trend of solar activity in the 21st century towards average Holocene conditions." Future solar activity is predicted to decline to "average Holocene conditions"
Abstract. Radiocarbon production, solar activity, total solar irradiance (TSI) and solar-induced climate change are reconstructed for the Holocene (10 to 0 kyr BP), and TSI is predicted for the next centuries. The IntCal09/SHCal04 radiocarbon and ice core CO2 records, reconstructions of the geomagnetic dipole, and instrumental data of solar activity are applied in the Bern3D-LPJ, a fully featured Earth system model of intermediate complexity including a 3-D dynamic ocean, ocean sediments, and a dynamic vegetation model, and in formulations linking radiocarbon production, the solar modulation potential, and TSI. Uncertainties are assessed using Monte Carlo simulations and bounding scenarios. Transient climate simulations span the past 21 thousand years, thereby considering the time lags and uncertainties associated with the last glacial termination. Our carbon-cycle-based modern estimate of radiocarbon production of 1.7 atoms cm−2 s−1 is lower than previously reported for the cosmogenic nuclide production model by Masarik and Beer (2009) and is more in-line with Kovaltsov et al. (2012). In contrast to earlier studies, periods of high solar activity were quite common not only in recent millennia, but throughout the Holocene. Notable deviations compared to earlier reconstructions are also found on decadal to centennial timescales. We show that earlier Holocene reconstructions, not accounting for the interhemispheric gradients in radiocarbon, are biased low. Solar activity is during 28% of the time higher than the modern average (650 MeV), but the absolute values remain weakly constrained due to uncertainties in the normalisation of the solar modulation to instrumental data. 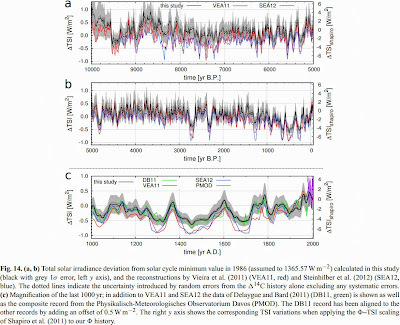 A recently published solar activity–TSI relationship yields small changes in Holocene TSI of the order of 1 W m−2 with a Maunder Minimum irradiance reduction of 0.85 ± 0.16 W m−2. 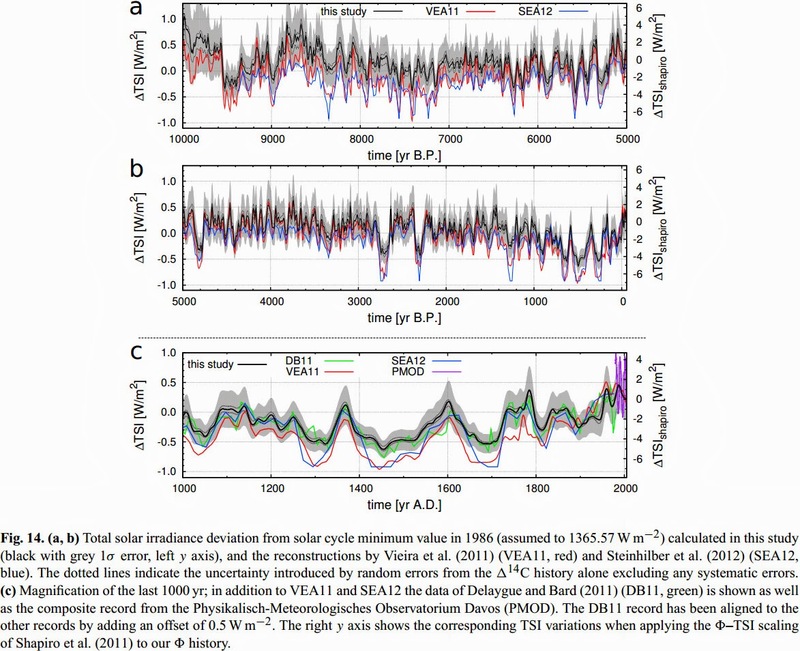 Related solar-induced variations in global mean surface air temperature are simulated to be within 0.1 K. Autoregressive modelling suggests a declining trend of solar activity in the 21st century towards average Holocene conditions.